One of the most important days of the year for Horizon athletics is Forsyth County Basketball Media Day. This annual event includes interviews of select varsity basketball players and coaches from across the county. 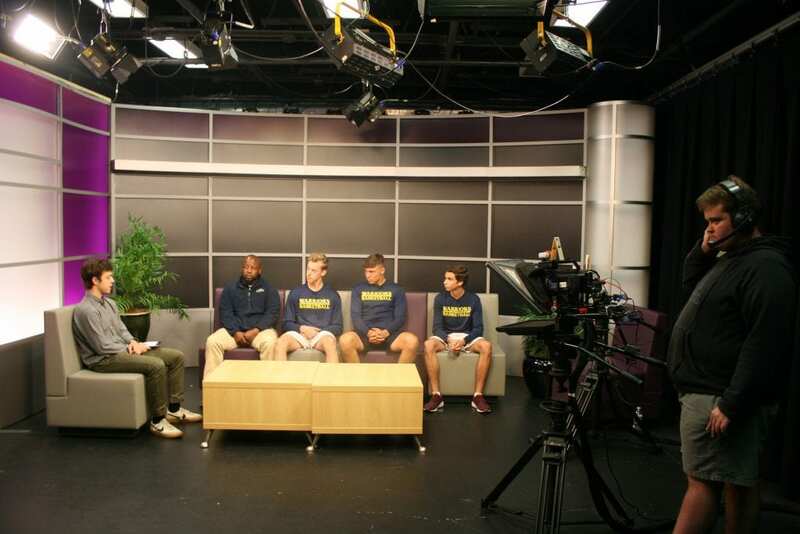 Each team has the opportunity to sit down with Forsyth County News editor Ian Frazier and discuss their previous season, new talent, and their goals for the upcoming season. This day is especially important for HCA basketball as it provides Horizon with the same kind of visibility as larger public schools. Horizon is well-respected for it’s basketball program as the last three years have included two state championships and a 2nd place finish. Coach Damon Taylor’s leadership and clear vision make Horizon basketball stand out. Because of this outstanding leadership, HCA is well respected for its basketball program. The last three years have included two state championships and a second place finish. The opportunity to play for a highly regarded team in a competitive league coupled with a great education serves as an important reason students transfer here. This year, seniors Mason Bierster, Michael Gul, and Ryan Stevens provided their thoughts on the season at Media Day. One standout question was who would fill the roles of Pablo Marrero and Alex Dahlberg from the class of 2018. Coach Taylor says it needs to be collective effort to account for the change from the last year, but he is excited for the new talent brought in this year. Taylor tells FCN that the team’s main goal is to, “get better every day”. With the team striving for excellence, a state ring is always in view and it seems be a strong possibility this year. On the girls team, Kailee Harper, Bennett Ross, and Clara Holtzclaw outlined their plans and excitement for this upcoming year. Coach Taylor, who also coaches the girls, mentioned that their most valuable asset is that the girls team already has chemistry as they have been playing together for several seasons. We look forward to an exciting season for both our boys and girls teams. Steve is the faculty sponsor for the student marketing team, which creates most posts and content for the webpage.